Editor’s Morning Note: Microsoft announced that there are 400 million ‘active’ Windows 10 machines. Is that a lot? Is it not a lot? Is it very a lot or not a lot very? In April of 2015, Microsoft forecasted that Windows 10 would run on one billion devices in two or three years. It was a notable comment at the time, one designed to drive developer interest through the promise of a large, and potentially lucrative install base. The company later backed off the pledge, saying that, due to changes to in its phone strategy, the threshold would take longer to reach. “Focusing,” in this case, is the sort of business-babble that lets a company say what it wants to in public while retaining sufficient deniability that it can ‘no comment’ any requests for clarification without blushing. A good question is how close Microsoft will come to its goal, and if it was ever on-pace to hit the threshold. Let’s have some fun! So was Windows 10 on pace? We’ll have to do some more work before we can answer that question. At its Build developer conference today, Microsoft announced that it expects Windows 10, its forthcoming operating system, to run on 1 billion devices in two to three years. That’s the idea, at least. I went on to call the goal “reasonable” in the moment, given the global pace of PC sales. A bit too optimistic on my part, it’s obvious now. The company went on to clarify that the pledge was good through the end of its fiscal 2018, which will wrap up midway through calendar 2018. So we can use the end of June 2018 as the final date that the original promise would have had to meet its minimum. Effective Windows 10 install base on April 29: Zero1. Average Windows 10 growth rate needed: 864,304 per day. Comparing that figure and the various tiers of Windows 10’s adoption pace, you can see that there were times during which Microsoft was on track to reach its goal. However, as Windows 10 lost its early-adopter and free-upgrade bumps, the company saw the goal slip from its hands. 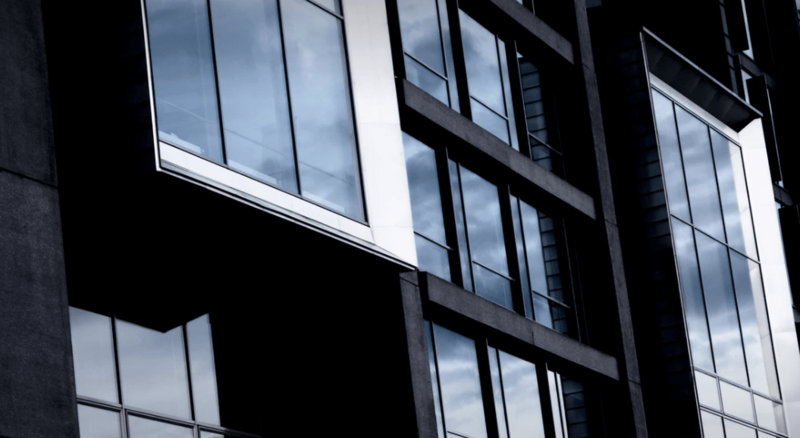 Microsoft’s most recent pace, set over a nearly three-month period, of more than 500,000 newly active Windows 10 per day, implies that Windows 10 will continue to grow quickly, but also that it will fall far short of the mark. How close will it land2? There were 641 days between yesterday and the end of Microsoft’s fiscal 2018. A 600 million device deficit over that many days works out to 936,037 per day. That’s higher than our prior averaged-pace requirement as it is making up for some lost — read: lower volume — time. Microsoft is going to miss by nine figures, it looks like. For shame? Somewhat, but not massively so. Without a high-volume phone plan, the bet made no sense, and I suspect that Microsoft didn’t enjoy going back on a developer promise. 64.3 million units divided by 90 days (one quarter): 714,444 per day. Microsoft’s most-recent Windows 10 pace: 561,797 per day. Max percent capture of new PCs by Microsoft3: 78.6 percent. Of course, that max percentage is overly aggressive, which implies that Microsoft is in fact not capturing at least a quarter of new PCs to other operating systems. If that number goes down, it may be a more bearish indicator than merely missing an arbitrary numerical threshold a few fiscal years hence. Windows 10 didn’t reach 14 million mark until late-July. 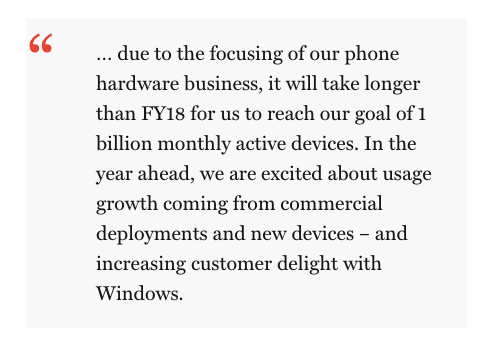 That means in April the active device volume was just Microsoft employees and nerds. I did some stupid math on Twitter yesterday that miscalculated Microsoft’s fiscal calendar dates (by a full year!) and therefore messed up this next bit. I am very sorry for being an idiot. It will, sadly, happen again. This percent is too high, as it discounts upgrades to Windows 10 from the aggregate Windows 10 active user base. However, we are merely showing the maximum percentage to make a point.